Cruise the Galapagos – add it to your list! There is no place on Earth quite like the Galapagos Islands. Lying some 600 miles off of the west coast of Ecuador, the Galapagos archipelago is world-renowned for its unique and fearless wildlife. Giant tortoises, sea lions, penguins, marine iguanas and different bird species can all be seen up close in the wild. The Islands were claimed by Ecuador in 1832, just 3 years before Charles Darwin visited on the Beagle. During the 19th and 20th centuries, the islands were inhabited by very few settlers and used as a penal colony which closed in 1959 when the islands were made a national park. In 1978 they were listed as a World Heritage Site. The island group consists of 18 main islands, 3 smaller islands and 107 rocks and islets. Seeing the sites and wildlife of the Galapagos is best done from the water with Cruises being the only option to see the majority of the remote islands. 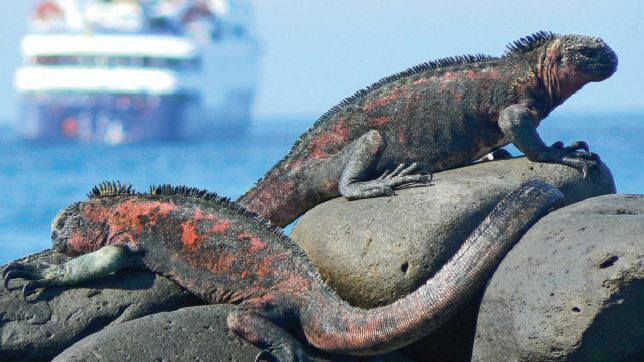 All Galapagos Cruises have fixed itineraries that is set by the National Park in order to control the number of tourists arriving at each island. We have clients of ours going this year, and think you might enjoy going some time as well. Be sure to bring a camera! This entry was posted in Cruising, Galapagos, Ocean Cruise, Travel and tagged Celebrity, cruise, expeditions, galapagos on May 8, 2013 by Paul - GetAway Travel Service.